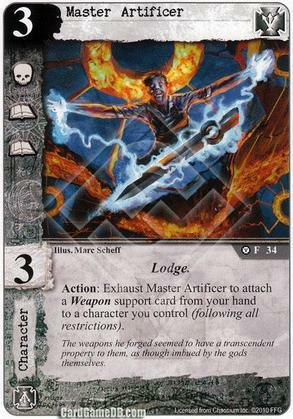 Flavor Text: The weapons he forged seemed to have a transcendent property to them, as though imbued by the gods themselves. Does this mean that you still have to pay costs? So you can exhaust this guy to play a weapon attachment outside of your operations phase? Meh. No, it bypasses cost. You just have to follow the attachment restrictions, e.g. "Play on a Agency character you control." Popping the Silver Lance onto a character after defenders are chosen seems pretty nifty, too. There aren't that many weapon cards in the game - currently a total of 16 according to the deckbuilder; 3 of them are of the Silver Twilight faction. As you'd expect Agency has the most (5) - as many as are neutral. Then there's two in Cthulhu and one in Syndicate. Most of them add icons, some add struggle icons, and some allow you to wound characters. Almost all of them can benefit from being put into play as a surprise. The main disadvantage is that you need to have the Weapon in hand. So, I guess it would be best to combine it with a card that can search for Weapons (or rather, since there's currently no card for that specifically, search for Attachments or Support cards). Being able to retrieve them from the Discard might also be useful - something that the Agency has dedicated cards for. Also, Silver Twilight has _a lot_ of great characters with cost 3 that will compete for a place in your deck. So, it will be a tough decision, whether including the Artificer will be worth it. Jhaelen hit the nail on the head with the problems I have with the card - Lack of options, and cost competition. The idea behind him is great, as cheating cards into play for free is always good. But the game would take many years to get far enough in the card pool for him to become a prime pick for me.